This entry was posted in Recovery & Support and tagged Addiction, Friends and Family of Addicts, Support, Trust on August 22, 2016 by Team Addiction Hope. Addictions sever relationships, replacing togetherness with what feels like insurmountable chasms. The foundations of a relationship may break apart in the wake of addiction, as cornerstones like trust and accountability disappear. When a spouse achieves sobriety, it does not magically put the pieces of your relationship back together. Rebuilding what you once had with your spouse is a joint effort that requires honesty, empathy and forgiveness. 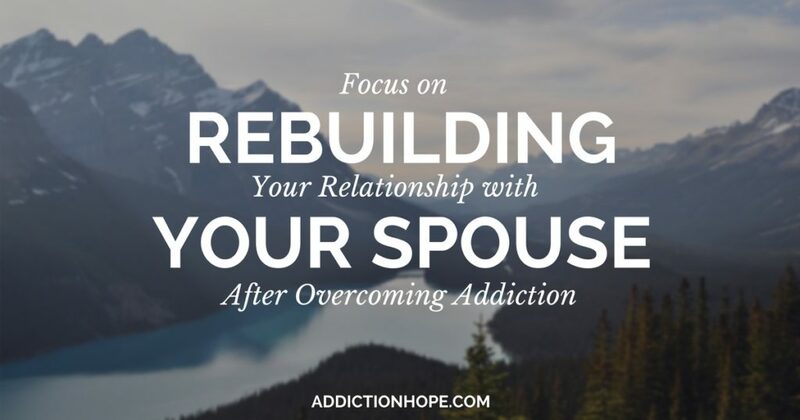 Perhaps the most difficult step toward reconnecting with your spouse is letting go of the marriage you had before the addiction. This doesn’t mean you have to let go of happiness, joy and what made you love your spouse. It means embracing a new marriage, one founded on tenets that your old marriage lacked. It doesn’t mean giving up hope that you will ever return to days of bliss. Odds are, your marriage pre-addiction wasn’t perfect. Now is your chance to start a new marriage, prioritizing the things you want to do differently this time. Change will not happen if it’s only in your head. Learning to trust your spouse again depends on your commitment to open, honest and frequent communication. During addiction, a couple’s communication is reduced or even eliminated. You and your spouse may have been unable to think or talk about anything except the addiction. Now is your chance to rediscover each other by sharing your hopes for the future. If you have any feelings of mistrust during the recovery process, make them known to your spouse. Discussing your fears openly takes them from the unknown and sheds light on the issues. Regaining broken trust is a long, difficult process that won’t come without setbacks. Consistently sharing your feelings with your spouse and encouraging him or her to do the same without judgment is the only way to reestablish your faith in one another. A phrase many AA members keep close to their hearts is, “Time takes time.” Recovering from an addiction is not an overnight process. Most recovering addicts must stay vigilant against addiction for the rest of their lives. It may feel like you’ve already wasted years of your life dealing with a spouse who suffers from addiction. You may want to give up. Your patience may be at an end. Keep in mind that your spouse is going through an incredibly difficult journey that will take time, but on the other side lies a husband or a wife who is healthier and happier than before. Trusting your spouse after addiction will not happen immediately, and it likely won’t happen as fast as you want it to. However, that doesn’t mean it will never happen. Set goals with your spouse and celebrate progress, even if it’s just a small step in the right direction. For instance, set a mutual goal to tell each other one truth every day for a month. At the end of the month, you’ll have established 60 or 62 truths you didn’t have before. That’s a big step toward trust and honesty, and it deserves some celebration. Most of all, be supportive of your spouse. Show him or her that you’re in this for the long haul, and that you’re proud of everything he or she has accomplished. The road to recovery may have a few bumps along the way, but be patient and encourage your spouse to stay strong. Recovering addicts need the love and support of their friends and family to stay clean and to look toward a brighter future. Be the light for your spouse, and watch your relationship shine. How have you attempted to repair a relationship that addiction has damaged (whether it was your addiction or the other person’s)? Please comment below.